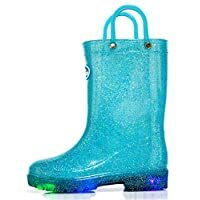 Girls Paw Patrol Glitter effect PVC Wellington Boots. PLease Choose US size to ensure fit, but note that the wellies have UK size printed on. Available in a size range from UK 5 / EU 22 / USA 6 to UK 10/ EU 28 / USA 11. 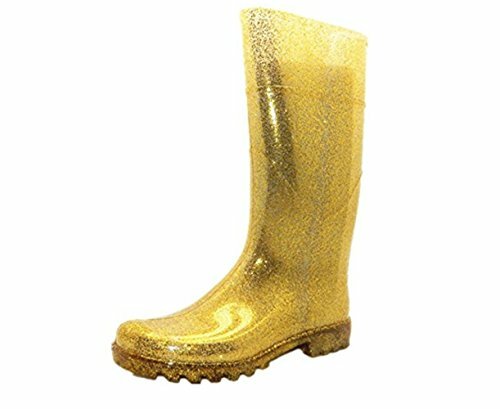 Peppa Pig Patrol Glitter effect PVC Wellington Boots. Available in a size range from UK 4 / EU 21 / USA 5 to UK 10/ EU 28 / USA 11. 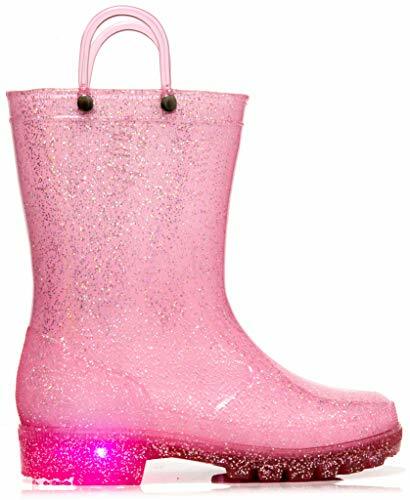 Pretty Unicorn Glitter infant girls wellies. Made to be worn with Thick Socks. Comfortable Fit, Fits true to size. Easy Pull on wear, forms to feet. ✔Comfortable and Chic Design:Kids Rubber Rain Boots are made from 100% rubber exterior for waterproof and durable; 100% cotton interior for maximum comfort and warmth. ✔Seasonal and Dry Wet Amphibious Use:The rain boots match most raincoats and umbrellas perfectly, in addition, they work great with thin or thick socks allowing for flexibility in seasonal use. Actually they apply to accustomed haunts of kids, no matter wet or dry, scorching or freezing. Pretty Mermaid Glitter infant girls wellies. STYLING OPTIONS : These super cute boots will keep you nice and warm in fall nights. Wear from Fall, Through the Winter, and Into the Spring. Available in Black, Grey, and Navy. 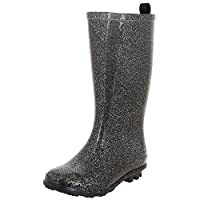 FIT MEASUREMENTS : 1.25" Heel Height, 6.5" Shaft Height from Heel, Boot Opening Approximately 11"
UPGRADED STRUCTURE, DIFFERENT STYLE:Hardwearing natural rubber,Textile lining,Water dispersing grip tread. WATERPROOF RUBBER UPPER:We provide a durable, strong rain boot that enhances your wear. We make our boots with a high content rubber formula maximizing flex, durability, and comfort. A COMFORTABLE BOOT TO OWN :We design our rain boots with materials that boost your comfort! We use soft-touch polyester/cotton blend lining that absorbs moisture. SUPPORTIVE FEATURES:We know support in footwear is a priority, so we made our rain boots with a hard rubber inner-sole board and steel shank to help keep your feet sturdy. SAFETY FEATURES:A unique feature of our boots is odor control. We treat our boots anti-microbially to resist odors and bacteria. STYLELISH: This will be your fall-winter essential piece that can pair up with many outfits! Slip on these flirty casual boots featuring low heel,round toe, ankle short shaft, slouchy PVC upper. DURABLE LONG LASTING COMFORT: Effortlessly slips these on and off. A sturdy rubber outsole ensures maximum comfort through prolonged wear.The Booties with the classic and fashion design adds to your perfect,elegance, temperament and taste. EASY ON/OFF: Effortlessly slip these on and off. Crafted with elastic sides for easy wear, adjusting to your foot size. A sturdy rubber slip-resistant sole ensures maximum comfort through prolonged wear. PERFECT BOOTIE: These boots have the classic style. The ankle, with flat heel make this bootie simple enough to wear with anything, but stylish enough to elevate your fashionable look. Waterproof & Easily Wear: The upper of the ankle boots is made of water resistant material so that it is uneasy for water/snow to permeate into the shoes, keeping your feet dry and comfortable. STYLELISH: This will be your fall-winter essential piece that can pair up with many outfits! Slip on these flirty casual boots featuring thin high heel,round toe, ankle short shaft, slouchy faux suede upper. EASY ON/OFF: Effortlessly slip these on and off.Back zipper for easy wear, adjusting to your foot size. A sturdy rubber slip-resistant sole ensures maximum comfort through prolonged wear. PERFECT BOOTIE: These boots have the classic style. The ankle, with stiletto heel make this bootie simple enough to wear with anything, but stylish enough to elevate your fashionable look.